College Historian and Professor Emeritus of History Jonathan Helmreich recently completed the first history of Allegheny in nearly a century. It is a richly detailed portrait of a school whose alumni have done much to shape the nation. The story that follows, which chooses a few key time periods in Allegheny’s history, is drawn largely from the book and an interview with its author. In 1815 a middle-aged minister arrived in Meadville with the unwavering conviction that he could found a college to serve up a traditional classical education of Latin and Greek in a region populated by farmers. Nor was this the limit of the Reverend Timothy Alden’s ambitions. He wanted an institution with a first-rate library housed in a grand main building at a time when other frontier institutions made do with log cabins and rudimentary book collections. His dream was, on the face of it, preposterous, and to make matters worse, Alden had little money for his new college. But Alden was a man of enormous determination. By force of will, he did manage to open his frontier college. But few of the region’s young men were attracted to its classical curriculum, and his grand plan for a great main building remained only a grand plan. For years, what was to become Bentley Hall sat unfinished while Alden scraped up construction funds. By 1828, with Bentley Hall still uncompleted, Alden’s vision was in ruins. In more than a decade of trying, the school had but a scant dozen of graduates. There was only one faculty member, Alden himself. More problematic was the shortage of students—there were none. Two years later the College closed its doors. If Allegheny had been a run-of-the-mill startup, it would have stayed shuttered. But Alden’s vision had taken seed in western Pennsylvania. The steps he had taken, however absurd they may have seemed at the time, provided the foundation for an institution that would rise again with help from the Methodist Church and produce graduates who would help shape the young nation. This is the tale that unfolds in Jonathan Helmreich’s new history, Through All the Years, which was drawn from numerous sources, including mountainous stacks of archival documents. Helmreich has produced a book that steers clear of the slick public relations approach that taints some college histories in favor of an honest book that presents Allegheny in both moments of greatness and moments that many would rather forget. Here, in more than 550 fact-packed pages, he describes an institution often beset by financial difficulties but always finding a way to overcome them; an institution whose students, faculty, and administration were deeply involved in the great national issues that have shaped the country. When the nation split in the Civil War, Allegheny students rushed to join the side of the Union. When the nation rose to world power status by defeating Spain in the Spanish American War, it was an Alleghenian, President William McKinley, who led it. When the contentious issue of evolutionary theory was thrust before the public, it was an Alleghenian, attorney Clarence Darrow, who eloquently took up Darwin’s cause in the famed Scopes Monkey trial. More recently, when the first fully implantable artificial heart was placed in a human patient, it was an Alleghenian, Robert Dowling, who performed the surgery. Allegheny was founded at a time when the average American was poor, and creature comforts, by and large, didn’t exist. Often, students walked from their hometowns to the College because they couldn’t afford a horse or stagecoach fare. It wasn’t unusual for students to walk from Pittsburgh, and sometimes much farther. Alden’s nephew, for example, walked from Cape Cod to Meadville. Yet even a year or two at Allegheny was enough to change young lives. William McKinley, with just a year at Allegheny, became president. Clarence Darrow’s abbreviated time at the College’s preparatory school in the early 1870s helped open the way to a distinguished law career in which he championed the cause of the underprivileged and the underdog. Graduates Charles Kingsley and James Mills Thoburn were but two of the scores of�Methodists�inspired at Allegheny who went forth�to�all corners of the globe, carrying not only the influence of Christianity but of the United States as well. While other college presidents simply sought to keep their institutions afloat in the economic riptide of the Great Depression, Allegheny’s new president held the odd notion that the down-and-out 1930s were as good a time as any to take the College to the next level. William Tolley was a confident man, with a vision to match his list of academic honors. By the time he arrived in Meadville in the summer of 1931, he was Phi Beta Kappa at Syracuse and held a divinity degree from Drew University, as well as a master’s and Ph.D. from Columbia University. Tolley was thirty years old, the youngest college president in the country. His youth might have counted against him; he was, after all, less than half the age of the most senior faculty. But, as Helmreich writes, Tolley possessed the skills to win others over. He had charm and a sense of humor and was willing to poke fun at himself. He had the ability to make each person with whom he spoke feel as if he or she were the sole focus of his attention. He also had no end of problems. Enrollment was falling, faculty salaries had to be slashed, and the endowment was down 90 percent. One telling sign of the times was the fall in value of Allegheny’s holdings in American Shipbuilding; the share price had fallen from $110 in 1927 to $1 by March 1930. His strategy for improving Allegheny was audacious. He instructed the College’s admissions representatives to go to the top high schools in Pennsylvania and Ohio and dangle scholarships in front of the best students. In the Great Depression, this was a powerful incentive indeed. As time passed, the shift in emphasis produced startling results. At the beginning of Tolley’s presidency, the College ranked 144th among 500 institutions in student quality, according to tests given by the American Council on Education. Soon, the quality of the entering class jumped to 72nd, then 64th, 32nd, 17th, and in the last year the test was given, Allegheny placed 6th. Tolley had done the unthinkable. Tolley also perfected the art of fund-raising, a necessary skill in the Depression years. He did it so well that Allegheny was able to add new buildings and gradually upgrade others during the twentieth century’s worst economic downturn. Even so, there was never enough cash. Termites gnawed at Ruter and Alden Halls, Ford Chapel, and Montgomery Gym. Meanwhile, Allegheny’s two great book collections—the original volumes collected during Alden’s time and journalist Ida Tarbell’s collection of materials she used in her famed biography of Abraham Lincoln—needed special facilities to protect them, but there was no money to build them. Then one day Tolley received a call from the librarian. A young man was proposing to buy little-used volumes for ten dollars each, money Allegheny could clearly use. When Tolley went to investigate, he found the man holding books from Alden’s era worth thousands of dollars, including John Elliot’s Indian Bible, the first Bible published in America. Tolley threw the shyster off campus. Before the Depression ended, the Alden and Tarbell collections had rooms of their own. It may take another hundred years before historians assess Allegheny’s impact on the new century. But the verdict is already in on many of the contributions Allegheny alumni made to the 20th century. Alleghenians helped discover a chemical element, performed ground-breaking surgery, won five Oscars, helped pioneer the cable television industry, wrote best-selling books for children, and headed some of the nation’s largest corporations. But perhaps the biggest impact came from President McKinley and journalist Ida Tarbell, class of 1880. The pair made their marks between 1896 and 1906, and their actions did much to shape the country we know today. By the time they arrived on the national stage, the United States was emerging as the industrial powerhouse of the western world; its entrepreneurs had built great enterprises in steel, aluminum, and oil and given the world the telephone and the light bulb. Pioneering work in mass production, the automobile, and aviation was on the horizon. But the rest of the world didn’t fully comprehend the power of the upstart United States until McKinley took the nation to war against Spain in 1898. In that conflict, America didn’t just beat Spain, it pulverized it—in Cuba, where Teddy Roosevelt made his famous charge up San Juan Hill, and in the harbors of Santiago and Manila, where U.S. warships left the Spanish fleet in ruins. McKinley’s legacy might have ended there if he had picked a lesser man than Teddy Roosevelt as his second-term running mate. When McKinley was slain by an assassin’s bullet early in his second term, Roosevelt seized the presidency with his legendary energy and began to reshape the county. Roosevelt laid the groundwork for completion of the Panama Canal, which sped the globalization of trade, and he helped spur the emerging environmental movement by adding 250 million acres to the national forest system. Roosevelt also spurred the passage of federal laws to rein in the abuses of big businesses, such as John D. Rockefeller’s Standard Oil Company. 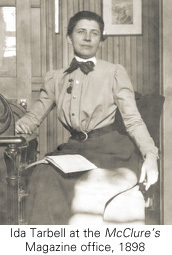 The nation wanted action—in large part because of revelations by a crusading group of young writers that included Ida Tarbell, whose two-volume History of the Standard Oil Company focused the nation’s attention on the world’s most powerful oil company. The influence of Tarbell’s work has lasted more than a century. When the New York Times assessed the great nonfiction work of the twentieth century, it ranked Tarbell’s classic as the fifth most important, in the company of Silent Spring. Tarbell helped set in motion three lasting trends. First, her work helped legitimize the idea that legal boundaries for business had to be set. Second, she helped shape twentieth-century journalism. Pick up the Wall Street Journal or the New York Times and reporters today use the same investigative techniques that Tarbell employed so effectively a century ago. Finally, she was one of the first women to shatter the glass ceiling in what had been a man’s occupation, the hard-bitten field of journalism. Throughout much of its history, Allegheny was in or on the verge of crisis. Money was always tight. Without a large endowment, downward swings in the economy hit Allegheny harder than many of its wealthier peers. But if you look at Allegheny from a distance, the appearance of hard times is deceptive. Timothy Alden struggled to open a college with a handful of courses, even as he scrambled to find cash for a single building. Today, it would take an afternoon to read Allegheny’s catalogue of courses and many lifetimes to take them all. Alden’s grand building, Bentley Hall, is surrounded in every direction by other grand buildings, and the complement of campus structures now numbers in the scores. Today, the College’s president, Richard Cook, is a chemist whose work helped spur a cleanup of the infamous Love Canal toxic waste site in New York. Cook’s specialty did not even appear in the courses of Alden’s era. But the differences in educational philosophy don’t reflect a change in the school’s mission. As Allegheny approaches its bicentennial, that mission remains unchanged. Then as now, the goal was to bring the best students to Allegheny, give them the tools they need for a lifetime of learning, and send them into the world to make their mark. Jonathan Helmreich’s Through All the Years (500 pages with almost 900 illustrations), is available through the College’s bookstore at $45 per copy (including tax). Shipping/handling is an additional $4.95 per copy. To order, visit http://www.allegheny.edu/administration/bookstore/ or call (814) 332-5369. This article was featured in the Summer 2005 issue of Allegheny Magazine.